Cleaning snow from driveway areas around apartment buildings is traditionally done manually. The use of snowplows for cleaning such small areas is economically impractical and difficult due to parked vehicles and the complex geometry of each site. 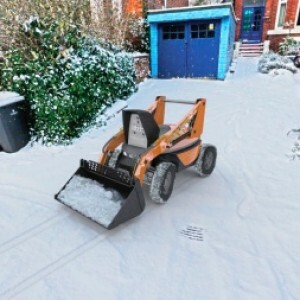 However, the described job can be done effectively by a small-sized, highly mobile snow-loading robot based on the SRX1 platform. Its small dimensions allow this robot to easily clean zones previously accessible by shovels only. The robot is equipped with a front-mounted snow bucket for effective snow cleaning. In addition to removing snow from a flat road surface, the snow bucket allows the robot to move the collected snow and pour it into three-foot high piles. 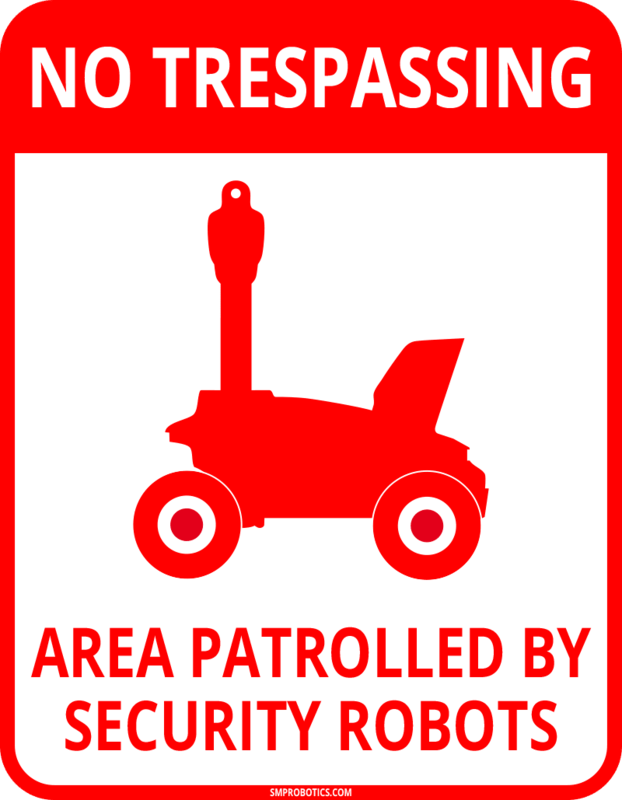 A snow-loading robot has an electric drive system to ensure virtually silent running. 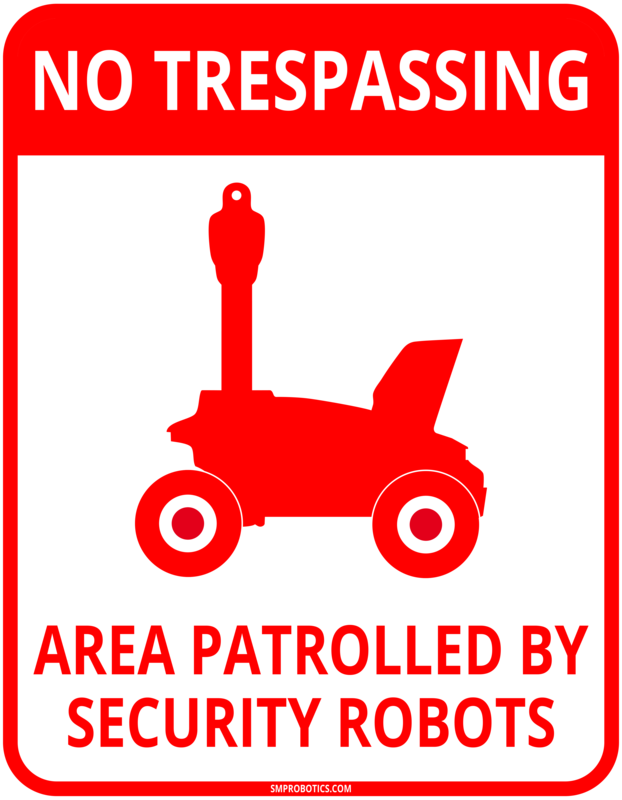 Even late at night, it will not disturb sleeping citizens, which makes this robot suitable for 24-hour operation. Regular snow cleaning helps to keep the pathway surfaces clean with less effort and prevents snow freezing caused by constant snow tramping by pedestrians. 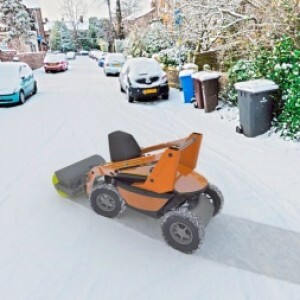 The use of an electric snow-loading robot is very cost efficient. Input power of 3 kilowatts is enough for cleaning an area of 110 square yards with a snow depth of 2 inches in only 1 hour. Build-in accumulators can be easily charged without an operator’s involvement using a wireless charger. Weather conditions do not always allow immediate snow removal. Precipitation in the form of snow or rain may lead to hidden ice formations in thin layers of snow. 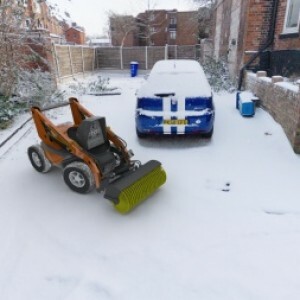 In these circumstances, using a snow broom will effectively remove snow and partial destruction of ice as well as applying de-icing agents to cause ice dissolution or antiskid mixtures to reduce the coefficients of friction. A street snow-sweeper robot can successfully manage the above tasks, because it is equipped with a snow broom and a spreader for de-icing agents or antiskid mixtures. Both robots have proven to be effective not only in urban environments, but also for cleaning locations near private residences. A street sweeper robot has a mechanical broom, which allows it to remove fallen leaves during fall in addition to sweeping walkways throughout the year.